Apply & Become a Management 3.0 Facilitator Today! Home » Facilitators » Become a Management 3.0 Facilitator! You want to spread the message of better management and leadership? You enjoy speaking in front of a group and hold workshops? You want to help people become leaders, change agents and be happier at work? Join the Management 3.0 movement today! Become a Management 3.0 Facilitator! Once you’ve finished a Management 3.0 Workshop and received your Certificate of Attendance, you also qualify to become a Licensed Management 3.0 Facilitator to give workshops like this! How to become a Management 3.0 licensed facilitator? 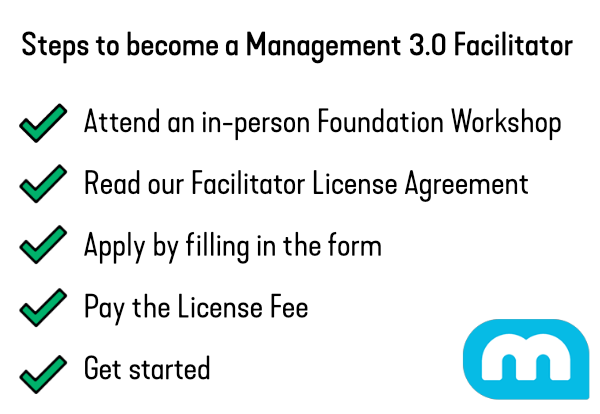 In order to earn a Management 3.0 Facilitator License you should have attended an in-person Management 3.0 Foundation Workshop. At this workshop you will have experienced Management 3.0 practices yourself in the group and understand what Management 3.0 is all about. The Certificate of Attendance which you receive after attending the Foundation Workshop qualifies you to become an official Facilitator yourself. After you have taken this first fundamental step you can then apply for a Management 3.0 license by filling out the form below. Please make sure to read our License Agreement (PDF) before filling in the form. It describes what you can expect from us, and what we want from you, as a Licensed Facilitator. Don’t worry, no organs or souls are being harvested! It’s just convenient to have a document of our commitments. If you haven’t had the chance yet to attend an in-person Management 3.0 Foundation Workshop you can become a Facilitator though: Earn yourself a Certificate of Practice by experimenting with at least seven Management 3.0 Practices and sharing your experience. Once you have received the Certificate of Practice you can apply for becoming a Facilitator. I loved the workshop content and experience. It’s similar to what I was working towards creating myself–but better! Why reinvent the wheel, especially one that is so reputable and beautifully illustrated? The topics are incredibly relevant and timely. I’m looking forward to hosting these workshops here in Cincinnati! I was introduced to Management 3.0 about 2 years ago, read the book, experimented, attended the Gathering in Frankfurt and thought that this was the missing link in all „agile transformation“ initiatives. So I wanted to spread the word. It is very important to our Management 3.0 team that the fees we ask for our services are fair and easy to bear for facilitators and participants worldwide. It is also important that we don’t drive our bookkeeper crazy with a hundred different fees and currencies. That is why our subscription fees, event fees, and certification fees depend on the average GDP level per capita, per country, divided into five categories. It is not a perfect system, but it’s creative, it’s easy enough to agree on, and it’s fairer than charging the same price to everyone, regardless of their cost of living and purchasing power. And our bookkeeper said OK. In addition to our yearly License Fees we charge Event Fees for every paid workshop you run and which are also determined using a location-dependent price index. We show the fees per hour, but a total number of hours — a typical Foundation Workshop lasts counts for 16 hours — is invoiced after the paid-for event is held. Category C countries: 43€ per hour (except Poland & Turkey: 37€ per hour). 43€ is also the price if you hold online workshops, irrespective of country. For example: For a facilitator offering a Foundation Workshop (16 hours) in Germany — a Category B country — we charge 928€ = 16 hours multiplied by 58€. How did you hear about becoming a Management 3.0 Facilitator?